Planning your biggest day should be thrilling, so if you’re wanting your wedding stationery handled and created properly — that’s where I step in! Weddings can be quite an investment and stressful at times, and I want to be that friend and say, it will all be worth it. As your relationship is amazing and there is nothing simple in telling your love story, I would love to go deep and get to know you better as a couple. I love working with couples who are madly in love with each other and are so excited to share the next chapter in their lives. Your wedding details are as unique as your relationship, which is why I offer truly bespoke stationery that can be fully-customized based on the most important message you’d like to share with the most important people of your life. To ensure that I am providing the most exceptional service and full attention to details, the studio takes a very limited number of custom clients a year. Timeline and pricing for fully-custom suite designs may vary based on project scope, quantity of pieces, and complexity of the details. Please get in touch as soon as you think we may be a good match! I recommend getting in touch as early as 9-12 months prior to your celebration date. 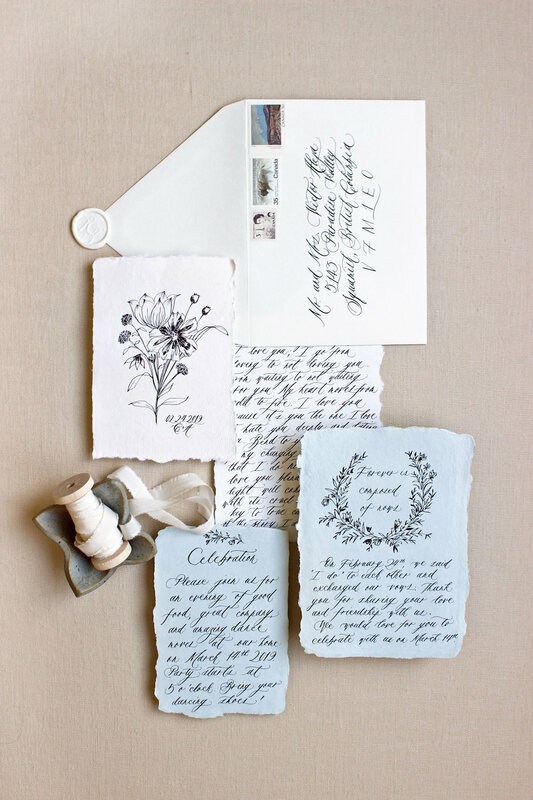 Recommended to couples who would like to work from ground up and have custom-tailored wedding stationery created by us. When do you require your materials? Timeline varies for each project. Please get in touch right away so I can schedule your event goodies accordingly. With your budget in mind, we can make suggestions based on your stationery needs and what may work best for you as a couple. Check all that apply. If there's something you need that's not on the list, please check OTHER and include it in the Important Details box. Select one or a few, we'll see what we can do! Would you need day-of items as well? How do you want your invitation suites to feel? Please mention here anything you'd like to share about your dream wedding stationery. Or better yet, tell me about your love story! If you have availability for a phone call consult between 9am-5pm PST, please leave your phone number & the best time to reach you at below. Please note, communication is key for Bespoke Stationery most especially in the beginning stages of creating your invitations. We want your pieces to be perfect. Thank you for your interest in my work! I will get back to you as soon as I can with a custom estimate quote and timeline. Interested in a Semi-Custom Suite instead?